“Forts are the very basis of a kingdom. They are the real treasure, the real wealth of a kingdom. Be it the Marathas, Yadavas, or Chalukyas, rulers of almost every dynasty in Maharashtra gave tremendous importance to the construction and maintenance of forts. That’s one of the reasons you will find a fort in every nook and cranny of Maharashtra. Pune is a city that has a large number of forts around it. Many of these forts were built by Chhatrapati Shivaji Maharaj, the great Maratha warrior king. Today, these forts that are a testimony to the epic battles that went down in history, attract a large number of tourists from all parts of the country and the world. In fact, some of these are popular trekking hotspots too. 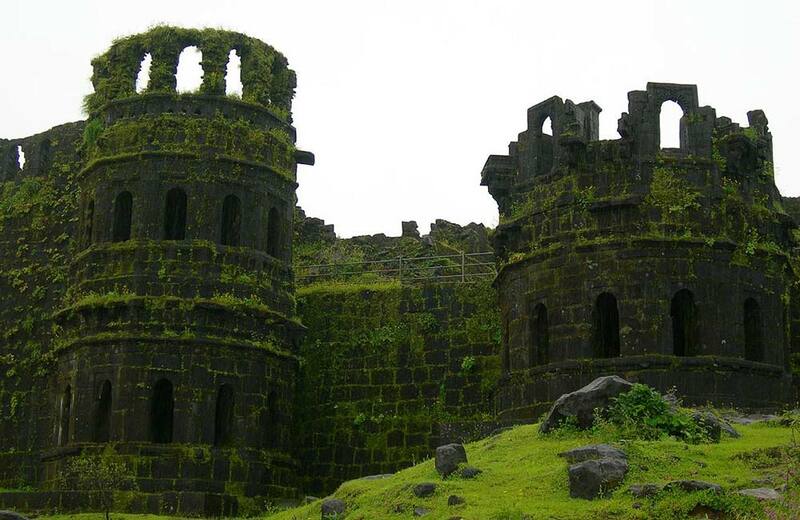 So whether you are a history buff, trekking enthusiast, or simple tourist like me who loves to explore new places, here’s a list of the top forts near Pune that must be on your bucket list. The 2000-year old fort has been the site of many battles, with the Battle of Sinhagad (1670) being the most notable of all. 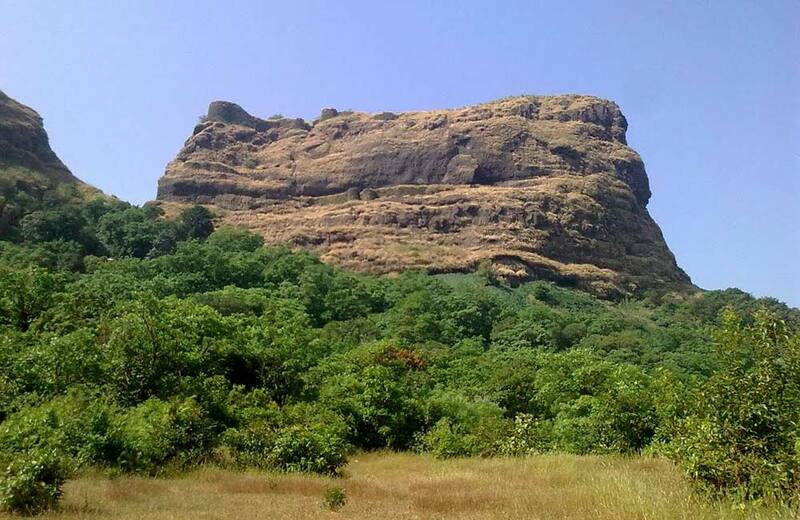 The fort was named ‘Lion Fort’ (Sinhagad) to honor the sacrifice of Tanaji Malusare (right hand of Chhatrapati Shivaji) who lost his life while fighting the Mughals in the battle. The fort, built on the top of a hill, offers an amazing view of the lush greenery surrounding it. Pune Darwaza and Kalyan Darwaza are the two entrances to the fort, with the former being the main entry point for visitors. There are a few temples and a memorial built for Tanaji Malusare inside the fort. Although there is a motorable road till the entrance, trekking to it is preferred by many youngsters. 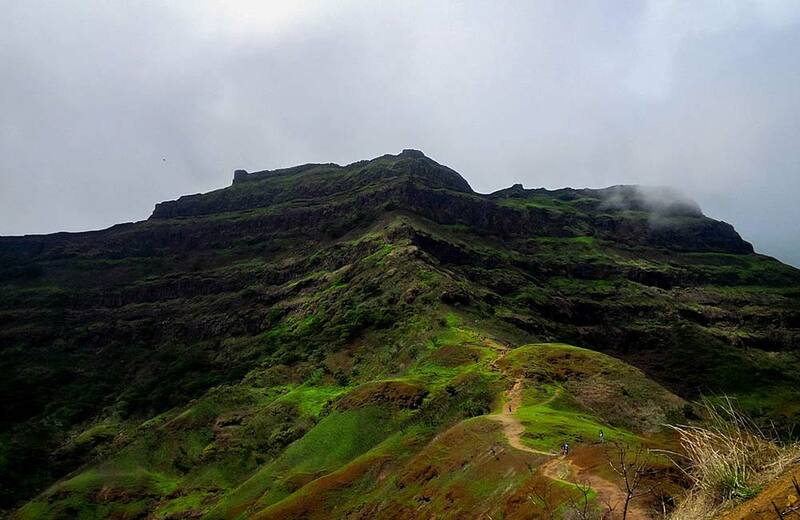 The 13-km trek has a medium difficulty level which makes it one of the best forts near Pune for trekking. Located around 4500 feet above sea level, Purandar Fort was the birthplace of Sambhaji, the son of Chhatrapati Shivaji Maharaj. The fort is of great historical significance as it marks Shivaji’s rise against the Mughals and Bijapur Sultanate. However, Shivaji was not the only ruler of the Purandar Fort, as it was the Yadava dynasty which constructed it in the 11th century. An hour-and-half drive amidst the picturesque Western Ghats range will take you to this huge hilltop fort. On reaching the fort, you will notice that the fort has been divided into two distinct levels – the upper level known as Ballekilla and the lower level known as the Machi. Both the upper and lower levels house temples dedicated to Lord Shiva and Purandareshwar, the fort’s patron deity. Besides being a popular tourist spot, a part of the fort is used as the training academy of National Cadet Corps. The place is also a hotspot for paragliding and trekking, giving you another reason to come here. Tikona Fort, meaning triangular fort, derives its name from its pyramidal shape. 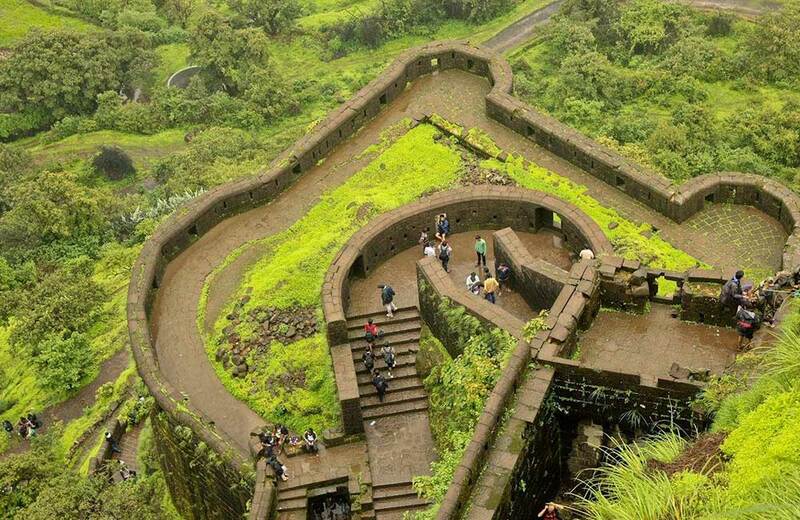 It is a major hill fort in the Maval region near Lonavala, built during the Silhara dynasty’s rule. Nestled in the lap of the Sahyadri Ranges, this 3500-feet high (altitude) hill fort has its colossal entrance as its major highlight. Besides this, it is also popular for its Trimbakeshwar Mahadev temple, seven water tanks, Satavahana-era caves, and a breathtaking view of Pawna Dam. The nearest starting point for the hike to Tikona Fort is the parking area near Tikona Peth, the base village for the excursion. The trek is safe, and it will take you around an hour to reach the entrance of the fort. From here, the journey becomes a lot exciting as the steps to the top are very narrow. It is, therefore, advisable to avoid climbing the fort in large groups. Popularly known as the ‘Iron Fort,’ Lohagad Fort is a perfect convergence of rich historical legacy and exquisite natural beauty. It enjoys an intriguing history under several dynasties, with the majority of time spent under the Marathas and a short interval under the Mughals. 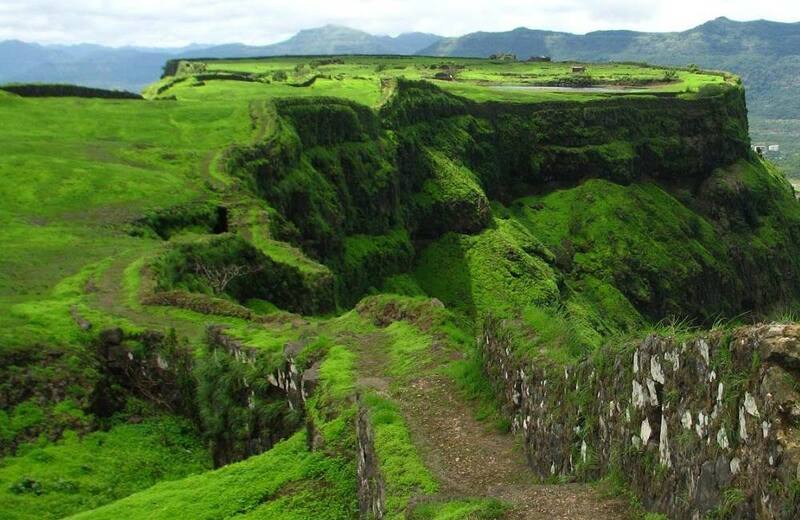 If you happen to travel to the fort during monsoon, you will see the fort’s top covered with clouds and moss. Though monsoon is an excellent time to visit from a scenic point of view, you must take precaution because the roads and trails leading to it get slippery. Entry to the fort is possible by four major Darwajas (doors), out of which Hanuman Darwaja is said to be the oldest. The main premises of the fort houses an old dargah and Laxmi Kothi where the treasure of Nana Phadnavis, an influential Maratha minister, was kept. When visiting the Lohagad Fort, one should not miss out on the nearby Karla Caves, Aamby Valley City and Bhaja caves. Tung Fort is known for its breathtaking beauty. It stands at an elevation of 3526 feet above sea level and is surrounded by water on three sides. 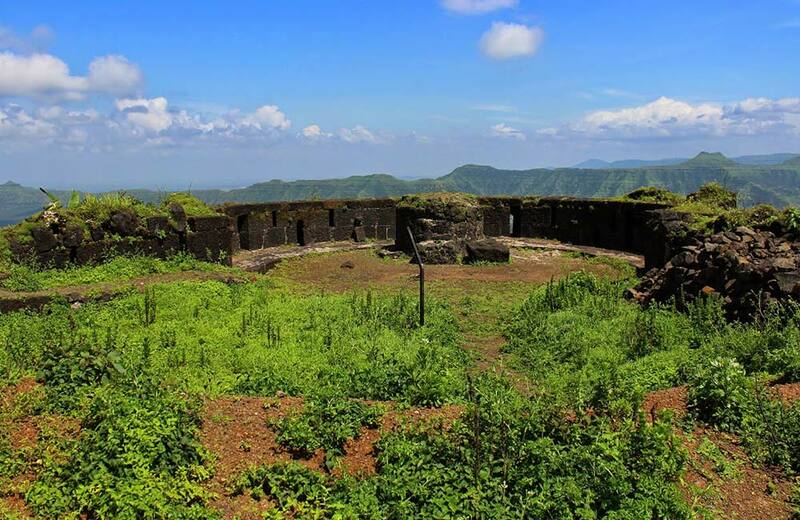 Tung Fort is referred to as Kathingad Fort because of its conical shape, and steep steps. What’s more is that the fort is accessed via a narrow path carved into a fairly vertical cliff, which makes it a difficult climb. The Adil Shahi dynasty built it in the 17th century, but the great ruler Chhatrapati Shivaji Maharaj captured it. Its small size ensured that troops could not be garrisoned in the fort. The fort was a perfect hideaway from invaders because of its beauty and difficulty of access. Local Maratha inhabitants loved this fact because it gave troops in neighboring forts time to arm themselves to fight off an attack by outsiders. Indeed, at one time it served as a watchtower for the great Maratha dynasty. 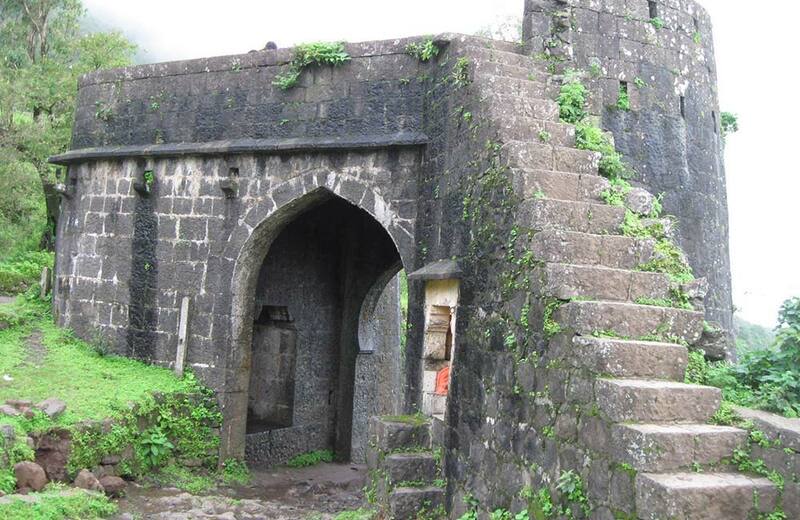 Tung Fort is located near the Tungwadi village, which is also accessible from Lonavala. It is a climb of approximately 300 meters from the village to this fort, and travel is difficult because the only road leading to the fort is rough and unfinished. 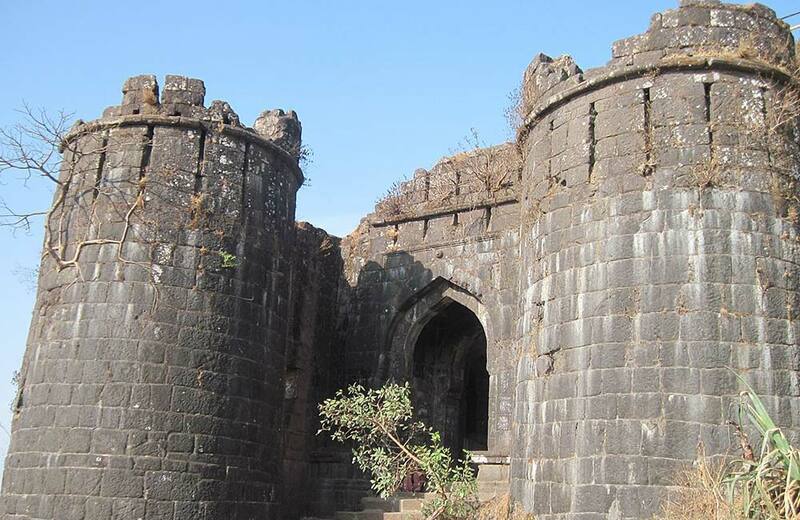 Rohida Fort, one of the premiere forts near Pune, was built during the rule of the Yadavas. Shivaji Maharaj captured this fort from Bandal Deshmukh, only to later hand it over to the Mughals in the Treaty of Purandar. The fort is popular among tourists for its Rohideshwar Mandir, and the seven bastions that are in good condition. It offers a brilliant experience for trekking enthusiasts, who can are required to take an hour-long hike to this 3650-feet high fortress, which has been a witness to significant historical shifts. The trail to the top is hemmed by moss and dense vegetation on both sides. The historical significance of Torna Fort is that it was the first fort captured by Chhatrapati Shivaji Maharaj; thereby, making it the foundation of the Maratha empire. 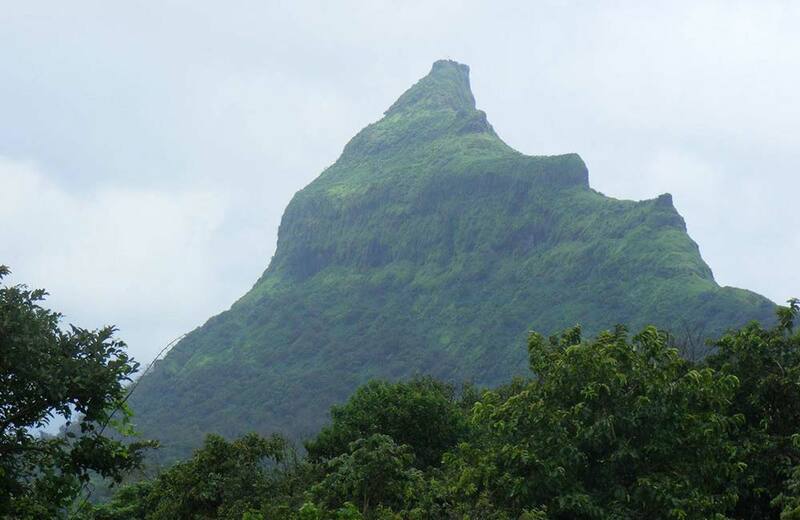 With an elevation of over 4600 feet above sea level, it is also the highest fort near Pune. Over the years, it has become one of the favorite destinations for anyone who wishes to experience history amidst the opulence of natural beauty. Torna Fort is also a popular trekking hotspot, and the best time to visit it is between September and December. The trek begins from Velhe village as its base. One will first get the exalted view of the fort in the distance after a walk of 200 m. The entire trail is dotted with rocky patches hemmed by dense vegetation. The 4-hour trek goes through various structures like Bini Darwaza, Menghai Goddess Temple, Budhla Machi and the majestic Zunjar Machi. If you are trekking to the fort during the monsoon, be a little careful as the trail becomes slippery in patches. Located on an irregular hilltop, Kenjalgad Fort is a rhomboid fort that can be seen from a long distance as one approaches it. It was built by the Bhoj rulers during the 12th century, and it was later captured by several rulers, with the British finally taking it over in from the Marathas in 1818. And although the fort resembles a derelict façade, as a large part of it was dismantled by the British, its walls are still standing tall, overlooking a beautiful valley. The sight of the clouds covering the fort during the rainy season will leave you awestruck. The fort isn’t fully accessible by cars due to poor road condition beyond crossing Bhor village, which is around 25 km from the fort. There are two routes to the fort: one starts from a col joining Kenjalgad and Raireshwar Plateau, and the other from Ghera Kenjal, which serves as the base village. A reasonable hour-long trek from Ghera Kenjal will lead you to the summit of the plateau. Although the trek route is safe, attention should be paid to the slippery patches in between. It is advisable to carry food and water on the trek owing to the shortage of shops on the route. 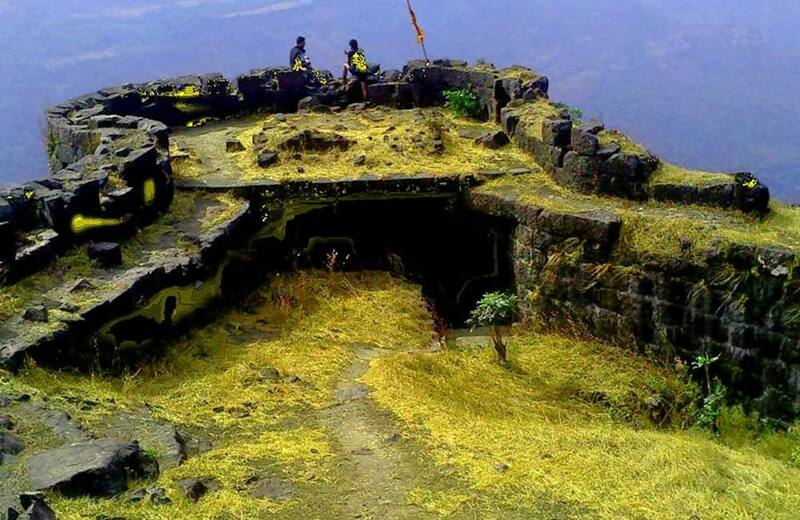 Korigad Fort, which is around 3028 feet above sea level, is one of the highest forts in India, making it a popular trekking destination among youngsters. The fort was unknown for long until Shivaji Maharaj incorporated it into his kingdom in 1657. The fort remained under the Maratha empire before getting captured by the British in 1818. There is a temple dedicated to a local deity, Korai Devi, and many other small temples dedicated to Lord Vishnu and Lord Shiva inside the fort. The 2-km defensive wall is the main highlight of the fort. It is completely intact, and you can walk along its perimeter. Besides these and several other structures, there are six cannons inside the fort, with Laxmi Toph being the largest of all. As there’s no motorable road to the fort, you need to park your vehicle at the parking provided near the bus stop in Peth Shahpur village. From here you need to trek to the top. As it’s an easy climb, even beginners can undertake the hike without difficulty. If you want to enjoy the mesmerizing view of the surroundings, we recommend taking a day trek to the fort during summer. If you wish to stay overnight, there are many camping sites on the fort, including Korai Devi Temple that can accommodate around 25 people. Dating back to the 17th century, Shivneri Fort was the birthplace of Chhatrapati Shivaji Maharaj, the founder of the Maratha empire. Located near Junnar town, the military fortification has a memorial of Shivaji, known as Shiv Kunj right in the center. The fort offers a panoramic view of the picturesque mountainous and beautiful lakes in the backdrop. The fort has been rightly rated as one of the most favorite places for sightseeing as it has some interesting spots, such as the temple of Goddess Shivai. Situated near Tamhini Ghat, the 300-year-old Ghangad Fort was a sort of jail used for housing prisoners. It was under the Maratha empire until March 1818, post which they had to surrender it to the British. The fort has two main gates with the arch of the main entrance missing. The place offers a panoramic view of Tailbaila, Mulshi Dam, Korigad and Sudhagad Fort. Ghangad offers one of the best camping sites in the region with ample space for setting up tents, making bonfires and cooking food. The trek to this fort is relatively easy from the base village of Ekole. There is a cave around 45 minutes from the starting point of the trek, after which the ascent becomes slightly cumbersome. A steep and robust metal ladder lies ahead, and it is advisable to have an experienced guide along with you. Raigad Fort is another witness to the glorious past of the Maratha empire, be it the coronation of Chhatrapati Shivaji or the various battles that were fought here. The hill fortress was the capital of the Maratha empire during the reign of Chhatrapati Shivaji. Though many portions of the fort are in ruins, the remaining structures stand tall, testifying why Raigad Fort was called the ‘King of Forts’ as well as ‘Gibraltar of the East. There are towers, grand entrances, artificial lakes, a Shiva temple and many other structures inside the fort. Raigad Fort is a favorite among adventure enthusiasts because you have to either use the ropeway or trek to the fort, which is 2700 feet above sea level. Those who want to trek to the fort need to climb around 1700 steps from the foothills to reach the fort. Kothaligad Fort is a 3100-feet high fort situated in the Karjat area of Maharashtra. It is also called Peth Fort because of its proximity to the Peth village. 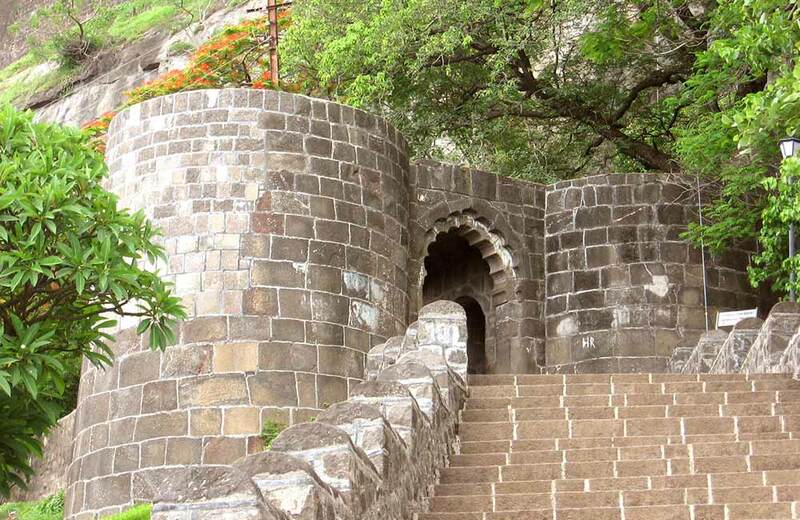 Its short height and easy climbing make it a popular fort near Pune for trekking. And though it is possible to drive to the Peth village, we recommend you trek from Ambivali to Kothaligad to come across some stellar viewpoints along the way. The fort enjoys an eventful historical background that includes the reign shift from the Marathas to the Mughals to the British. And, although the Marathas did manage to capture the fort from the British, that was for a very short span of time (less than two months). 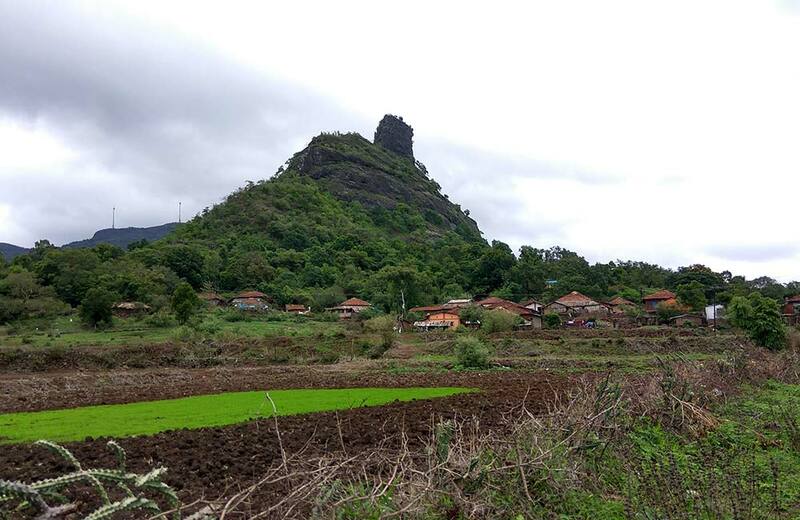 According to locals, Kothaligad Fort is not a fort, but a lighthouse (or a watch tower) that was used to give information about the advancement of the enemy. 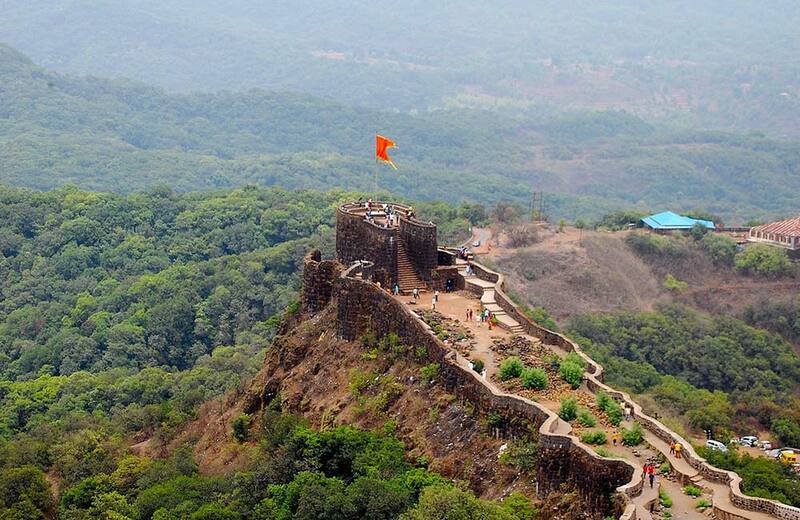 If you want to indulge in a day full of adventure, history and scenic beauty, Pratapgad Fort is the place to be. It is one of the most well maintained historical marvels in Maharashtra. Pratapgad Fort is also known as the Valour Fort as the heroic battle between Chhatrapati Shivaji Maharaj and Afzhal Khan took place here. The fort is divided into parts – the upper fort and the lower fort. The lower fort is largely occupied by Bhawani temple, whereas the upper fort includes several eye-catching structures. As Pratapgad Fort is located near Mahabaleshwar, it is frequented by several tourists. Around two to three hours of strolling around are enough to check out every nook and corner of this architectural beauty and its majestic surroundings. The best time to visit is around March and September as the weather remains pleasant during these periods. 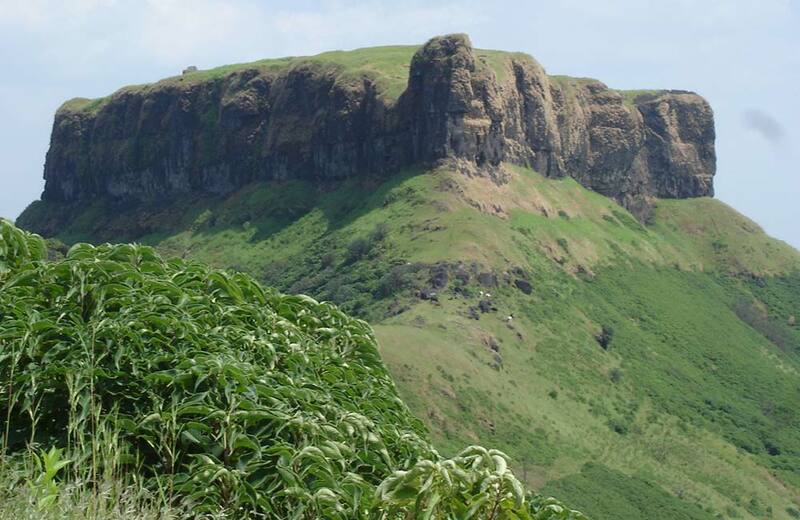 Surrounded by beautiful waterfalls, Rajmachi Fort is a nature lovers’ paradise. It was built by the Satavahanas and later captured by Shivaji Maharaj in 1657. The fort has two citadels – Shrivardhan and Manoranjan, with a wide plateau surrounding them. The fort provides a spectacular view, of the waterfalls, lush green forests, and hills. A Shiva temple and a big water reservoir constructed in 1780 are the two key attractions inside the fort. 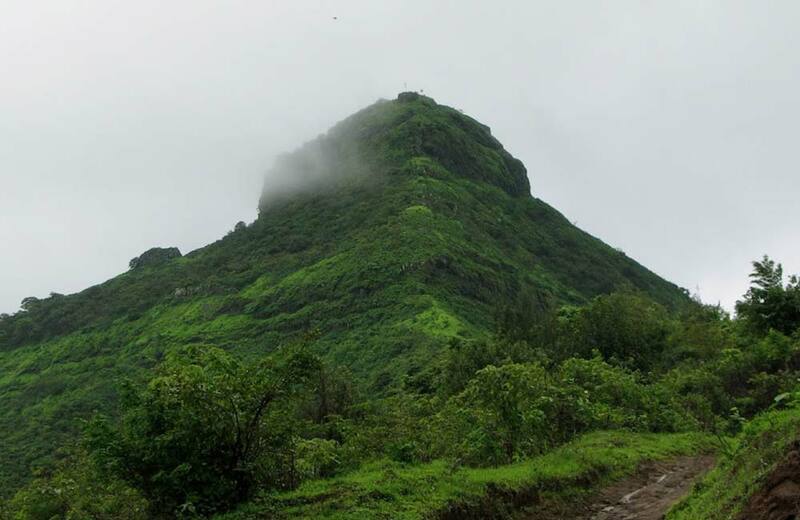 The rainy season from mid-June to mid-October is the best time to visit Rajmachi Fort, as the region looks beautiful with clouds and greenery everywhere. You can drive up to the Udhewadi village, and from there you can trek for 20-30 minutes to reach the fort. If you want a full-fledged trekking experience, we recommend starting from Kondana Caves; the hike will take around 3-4 hours. Next time when you book a hotel in Pune, make sure you book it for a longer duration so that you have ample time to visit these mighty forts in the region. And, we guarantee that even if you aren’t a history buff, you will be left awestruck by the sheer grandeur of these forts!